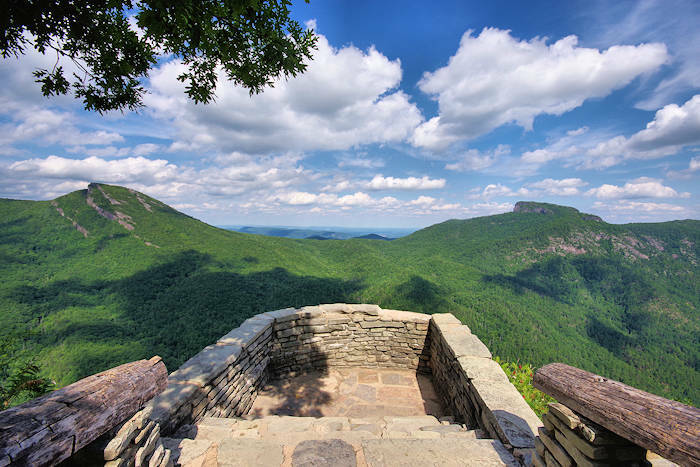 This 1.5-mile round-trip hike to the summit of Hawksbill Mountain (elevation 4,009 ft.) has an amazing payoff with panoramic views of the canyon of Linville Gorge Wilderness Area - with the valley floor and Linville River 2,000 ft. below you. On a clear day, you can even see the skyline of Charlotte - about 90 miles away! The strenuous hike climbs about 700 ft. in elevation, so allow plenty of time. It's definitely one of our favorite hikes near Asheville! 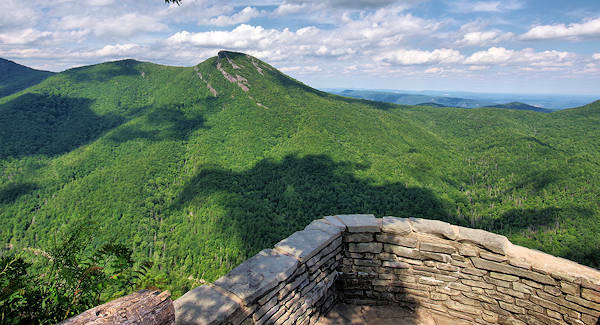 The 360-degree views from the top are some of the most spectacular you'll find in the North Carolina mountains. There are several great vantage points on the summit. It's an amazing spot for a picnic. Look east into the Piedmont, north to Grandfather Mountain or southwest to Mt. Mitchell. This rugged summit is adjacent to Table Rock, a similar hike a few miles away. Peak fall color views into the gorge are normally the third week of October. Note: The unpaved road is bumpy, so drive slow. Not a good choice for low clearance sports cars. Looking toward Table Rock (on left). The trail to the summit of Hawksbill begins from the parking area on unpaved Pisgah National Forest service road 1264. You start with a short downhill section, but then it's a gradual uphill trek. After about a half-mile, the summit trail turns left just before reaching the Jonas Ridge Trail (it's an obvious turn with a sign). From here, the summit trail gets progressively rockier and steeper. When you arrive at the top of the ridge with a large boulder, a trail goes both left and right to explore the summit. Go to the right on a narrow trail through the woods to reach the expansive rock face with the best views. Many go to the left only (since it's more obvious) and mistakenly think that's the best view. 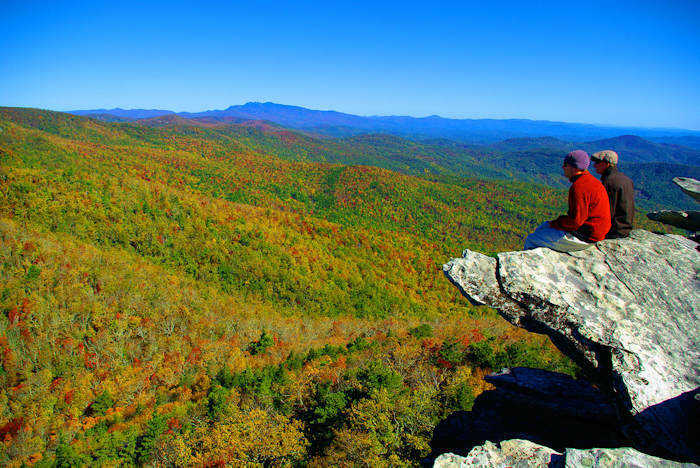 The Hawksbill Mountain hiking trail is about 65 miles from Asheville in Burke County. The shortest route is via I-40 east to Marion. 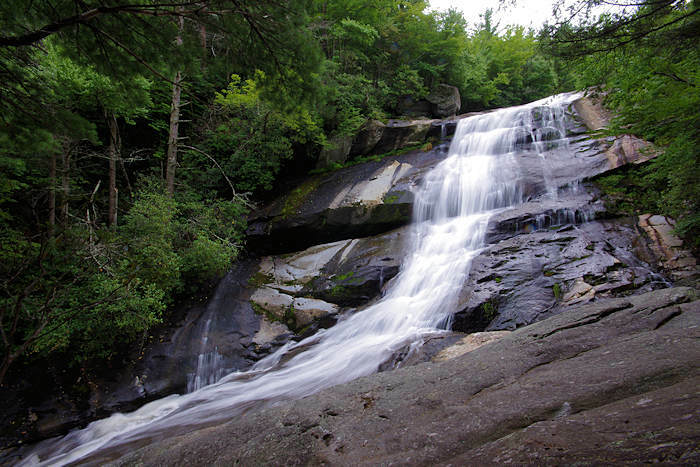 Then take U.S. Highway 221 north to the Linville Falls area, then Highway 183 to Highway 181. Go south three miles on Highway 181 to Gingercake Road (the second intersection with Gingercake Rd.). This is about four miles south of the Blue Ridge Parkway intersection with Highway 181. A half-mile down Gingercake Rd, stay left (follow Table Rock sign) on road 1264. The pavement ends in a mile. Continue about 2.5 miles on an unpaved, bumpy forest service road to the Hawksbill parking area on left (look for the big boulders that mark parking spots). The trail starts on right side of the road (look for the trail sign there). Find many places for dramatic photos. But, be very careful since one slip can be deadly. Do not let children roam on their own, and keep dogs on a leash. After hiking Hawksbill, drive about 4.5 miles down the bumpy road for the trail to the top of Table Rock Mountain (the last section of road closed January-March) and through The Chimneys. That hike is two miles round-trip, so you can easily do it on the same day. On the other side of the Gorge, hike to Linville Falls. 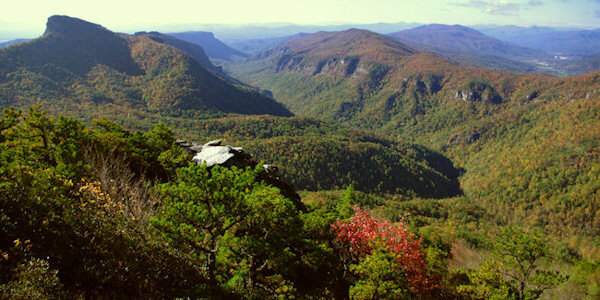 For another great view of Linville Gorge, hike to the top of Shortoff Mountain near Lake James. Camping also nearby at Lake James State Park. 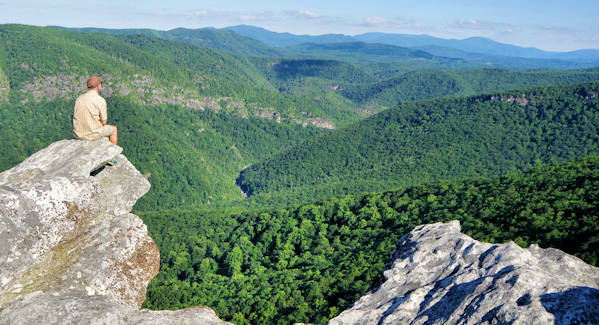 Also, see photos and a video of our flight over Linville Gorge. 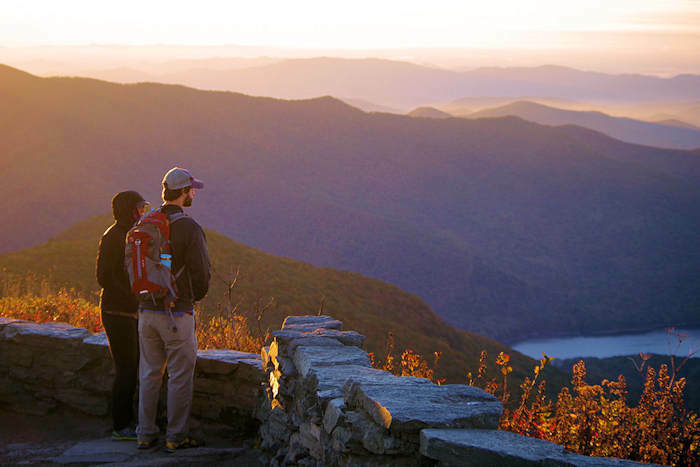 To see Hawksbill from across the Gorge, head to Wiseman's View for a panoramic vista. Read more.